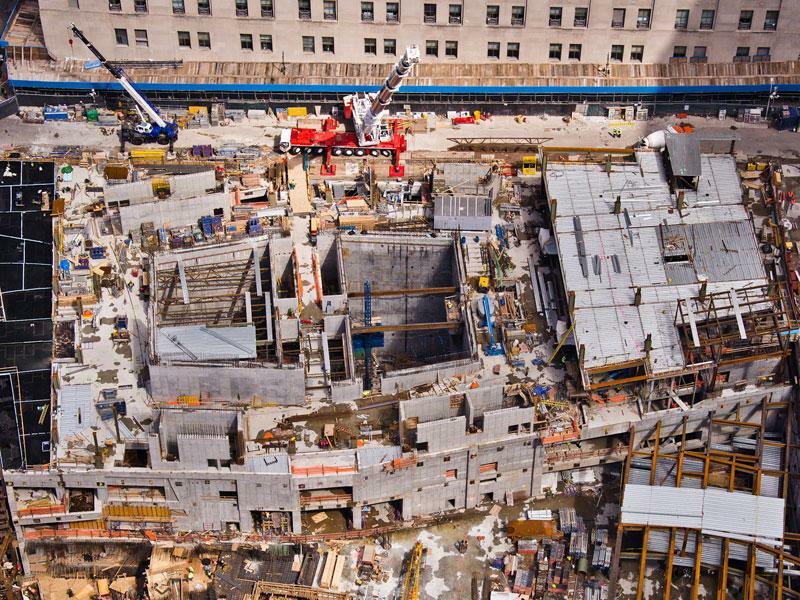 Doka USA is supporting the rebuilding work at New York’s Ground Zero with some high-performing formwork solutions. 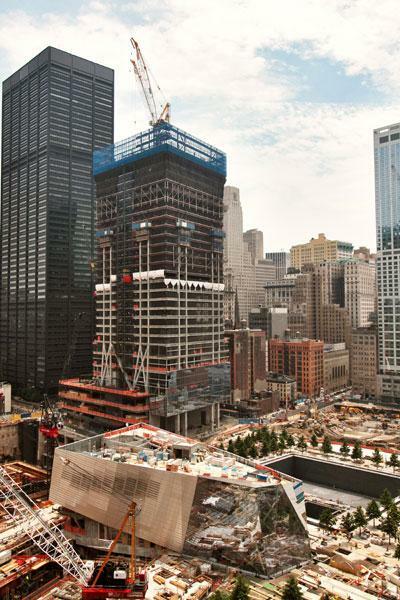 After providing formwork for the two square waterfall-pools at the National September 11 Memorial and for Tower 2, Doka is currently supplying climbing formwork and floor-slab formwork for the 72-storey, 297 m tall Tower 4 of the World Trade Center. 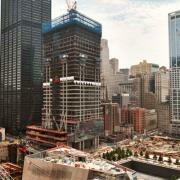 Once completed in late 2012, this will be the fourth-tallest skyscraper at the Ground Zero site. Architecturally, this office tower stands out for its two distinctly shaped floor plates and metallically lustrous glass facade. Up as far as the 47th floor, the building layout resembles a parallelogram. Above this, up to the 63rd floor, the storeys have a trapezoidal layout. The whole structure tapers as it rises, appearing to be straining towards the Freedom Tower, the tallest building at Ground Zero. Like most skyscrapers in New York, Tower 4 has a steel frame that is stiffened by a CIP concrete core on the inside and stabilised by ‘mega-columns’ on the outside. Installation of the steel frame takes place between six and eight storeys above the CIP concrete core. This means that co-ordination of the structural-steel and concreting works is a key challenge here. The very special formwork-engineering demands made by the tower’s distinctive design are being fulfilled by Doka USA in a highly professional manner: “Tower 4 is one of the more difficult skyscrapers being built here at Ground Zero. The differing storey heights, varying layouts and wall thicknesses, and the logistics, all present us with some really big challenges”, says Mike Schermerhorn, Doka Senior Account Manager for Tower 4. The up to 90 cm thick CIP concrete floor slabs are being cast using ready-assembled Dokamatic tables and the versatile Dokaflex hand-set formwork system. A Table Lifting System TLS frees up the crane for other tasks and quickly jumps the slab formwork up to the next floor. To increase productivity, the 27 m x 27 m structure core of the tower, which will house the stairwell and elevator-shafts, has been divided up into four mutually independent casting sections. 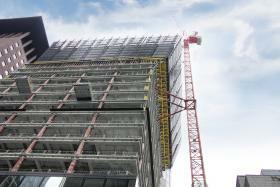 A high-performing duo of Automatic climbing formwork SKE100 and Xclimb 60 has been fielded inside the core. SKE100 has a massive load capacity of 10 t per climber, making it ideal for repositioning the large working platforms and the formwork units assembled from Top 50 large-area formwork elements. For this reason, SKE100 is also being used for the ‘mega-columns’ on the outside of the structure. The highly economical Climbing formwork Xclimb 60 is serving as a hoisting device inside the shaft, enabling building materials to be transported upwards on load platforms. Lightweight Framed formwork Frami is in use for the outside of the shaft. As the contractors Roger and Sons Concrete are casting the CIP concrete floor-slab together with the walls of the CIP concrete core in a single pour, the formwork panels are placed by hand. This system’s optimised hollow-section steel frames and weight-reduced Xlife sheets make for light and easy handling of the panels here. The Frami Xlife panels had earlier been used to form the V-shaped fair-faced concrete columns in the entrance concourse. 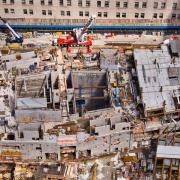 Thank you for your interest - Rebuilding at Ground Zero. Thank you very much for your interest - Rebuilding at Ground Zero.